J.J. Cannon's 1997 Hagerstown Suns were taking shape, but he wasn't yet exactly sure in late March who exactly he was going to get. And he was looking forward to getting that team, he told The Hagerstown Herald-Mail. "We are going to be very young but very talented," Cannon told The Herald-Mail. "I don't mind young because those players always work hard and keep learning. Their ability to adapt will make them better in the end." Cannon was returning for his second season in Hagerstown, part of a coaching and managerial career that stretched back more than a decade, but a career that would never see him make the majors. Before that coaching career, though, the once-young Cannon played a decade as a pro, including four seasons with time in the bigs. Cannon's career in baseball began in 1974, taken by the Astros in the first round of the January draft, out of Pensacola Junior College. He started at rookie Covington and single-A Cedar Rapids. He made AA Columbus by 1976, then AAA Charleston in 1977. It was also in 1977 that Cannon debuted in the majors, as a September call-up. He got into nine games for the Astros that year, getting two hits in 17 at bats. He returned to Houston for another eight games in 1978. For 1979, Cannon got his first regular big-league playing time after a trade to the Blue Jays. That year, he got into 61 games, hitting .211. In June, Cannon was a defensive replacement in the outfield, pulling back a Yankee home run, making it an out. "It was hanging up in the air," Cannon told The Associated Press afterward. "I didn't know if it was going out. I got back as far as I could and I got lucky and brought it down." Cannon played 70 more games for the Blue Jays in 1980. He got 50 at bats, but just four hits, ending his big-league playing career. By 1983, Cannon had started his coaching career, at single-A Kinston. He moved to AA Knoxville as hitting coach in 1985, staying there through 1990. 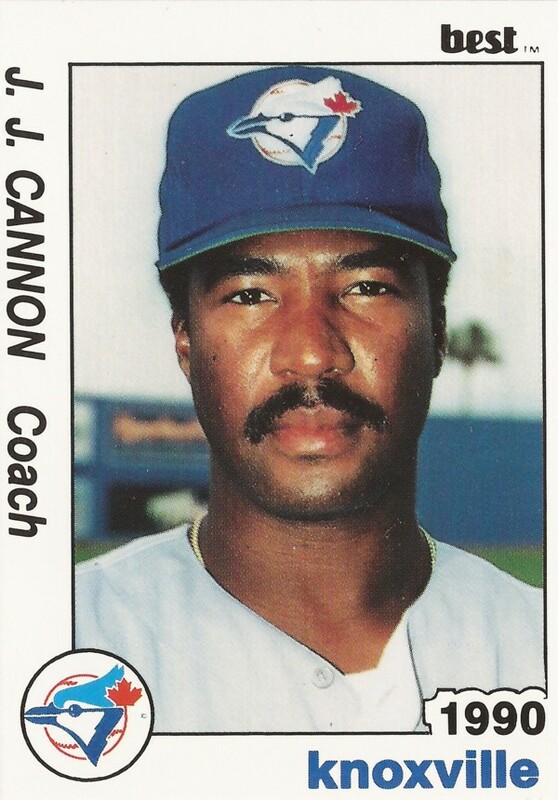 Cannon got his first managerial job in 1991, at rookie Medicine Hat, moving to St. Catharines in 1992. It was in 1996 that Cannon moved to Hagerstown. That August, Cannon picked up a five-game suspension for bumping an umpire and entering the umpires' dressing room after a disputed call. More recently, Cannon served as a coach with the high-A Frederick Keys in 2008. In May, Cannon watched the third catcher on his roster, Justin Johnson hit a two-run home run in a rare start, according to The Frederick News-Post. "Justin is probably one of the hardest working guys on the team," Cannon told The News-Post. "He really prepares himself well and tonight was a good example."